So the last 3 weeks have been rather manic. I have been finishing the write up of my research and completing my research portfolio that make up my masters level dissertation module. In real life terms that means I have basically been glued to my laptop for a huge proportion of everyday for the last few weeks. As I was traveling down to submit the hard copy today, I reflected on this particular journey and whether given the chance id change anything about it. Well probally yes to some of my methods, given a longer time frame I may have utilised more than one data collection method, but overall for the scale of our reseach in the scope of a masters, Im not sure I would have been able to do it well or with enough words to do any data justice. I have often wondered over the last few weeks if I could have been more prepared or whether my time management could have been better to reduce the last minuite stress; however I dont think with all the will in the world, I would ever, not have that last few weeks of pressure at the end. Actually I think a lot of my rounded and deep understanding on my topic developed within that time as I digested what my findings had actually highlighted in the scope of the literature already out there. I have also been reflecting of the positives of the informal research support network, that naturally developed among my peer group. I have at points hit walls in my thinking and struggled to get over or round them, but the support and willingness of friends to make me stop, re-evaluate and at points be brutally honest with me have helped my get past these hurdles (and answer the many formatting questions). The openness to help one another is refeshing and so different from my experiances within my undergraduate study. So too that great bunch of friends I am incredibly thankful. I am also grateful to have had a supervisor that appeared to understand where I was coming from alot of the time, which helped ease the pressure a bit. You know at those moments when you just think am I even in the right general area never mind using the right concept! Having someone there who has experience of research, to just be blunt and say that's not important, move on! As a novice researcher (if you can even call me that) was crucial in helping me use my time and concentration on what actually mattered. 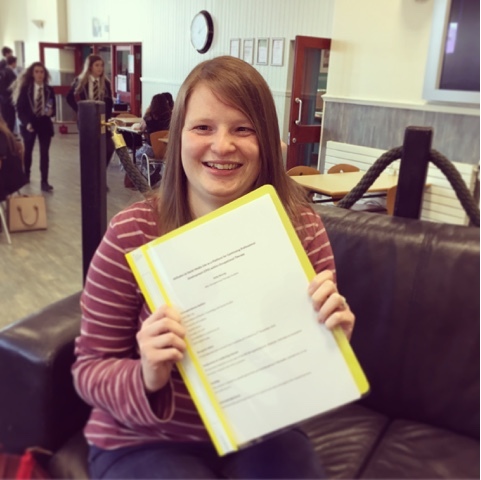 I cant however let this blog post pass, without thanking the people from outside my course that took the time to listen, proof read and generally make sure I had some occupational balance over the past month! So its handed in... And now we start the task of preparing for our elective placements that start at the end of the month! Well the last few weeks also included the last few classes of our Developing OT practice module, which is still a bit surreal, only placement brief and debrief, a 10 week placement and a viva to go!! !